Lixus Beach Resort a history of wellbeing. At the heart of an historic and idyllic region, the Lixus Beach Resort is characterised by contemporary architecture that is perfectly integrated into its authentic environment. Its state of the art infrastructure sprawls across a high-quality natural space that overlooks the Atlantic Ocean and borders a superb cork oak forest. Spread over five hectares, the club hotel is centred on the concept of wellbeing, getting back into shape, and sport. 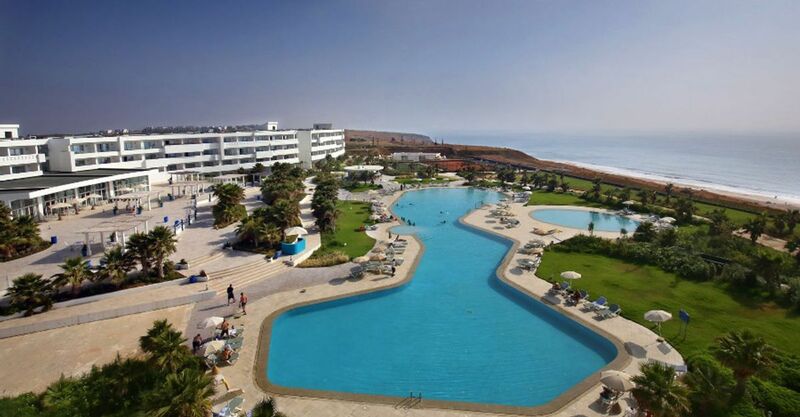 Lixus Beach Resort is in an ideal spot – 40 minutes from the Tangiers International Airport and less than a two-hour flight from the main European capitals. The climate is mild and temperate with the dry and hot season lasting from April to October. The average temperature for the year is approximately 23°C. This top class facility has 224 rooms laid out over two floors nestled into a hill that towers over the Atlantic Ocean. You will have a choice between three categories of spacious rooms of approximately 37m² (single, double and triple) with golf course or sea view, allowing all needs to be satisfied, whether it is a business trip or getting away with your family. The rooms are arranged with modern furniture and have a balcony or terrace. They are equipped with all the modern conveniences. 550m2 Spa & fitness centre, Sauna & Hammam, Heated 207m2 inside pool that is 1.45m deep, Yoga room, Fitness centre/gym, 6 massages and body/facial care cabins. 1 Chiringuito on the beach, 1 999m2 swimming pool that is 1.45m deep, separate kiddie pool, French-speaking and international entertainment, Water sports and dry land sports, Kids’ club, Boutique and hairdresser, 18-hole championship golf course. Le Tingis (Blue Lagoon): local and international cuisine with 250 place settings. Zélis: 150 place settings with Mediterranean cuisine, 1 bar lounge, 1 pool bar. Two meeting rooms that can accommodate 30 people each, 250-person marquee. All required equipment is available, Amphitheatre has a capacity of up to, 350 persons, Large, 12,000m2 garden. A truly exotic voyage with local quality products. Blue Lagoon and Zélis restaurants have their own style and character while sharing something in common: an all-inclusive formula. The hotel’s lounge bar and pool bar will unveil a collection of cocktails just for you and offers light meals for you to taste in a friendly ambiance. Enjoy it all – everything is included! The Lixus Beach Resort golf course adapts to all levels of the game, from beginners to advanced. This 18-hole course was designed by Spanish architect Enrique Saenger, who took advantage of the superb views offered by the site to offer you games with unobstructed forest and ocean views. The course is located on the seafront at an average altitude of 40 metres. Lixus Beach Resort also offers golf fans the opportunity to extend the pleasure of the game and the social side afterwards in the refined environment of their club houses. Larache is a favourite en route stop for recreational boaters who travel the seas between Europe, the Canary Islands, and the West Coast of Africa. When you get there, the blue and white city seduces you with its subtlety and authenticity. Its indolent charm allows itself to be discovered, with each walk through its streets and places, which bear witness to an omnipresent Andalusian influence that is always in harmony with the local habitat… Larache faces the ocean all along the Oued Loukkos, where trawlers find refuge after fishing. 45 mins from Tangiers International Airport, 12 km from Larache and 10 mins from the Lixus historical site.